Statues for legends, could it work for the Sabres? The Buffalo Sabres fortieth anniversary brought about some very cool festivities and features. A new alternate jersey, the Albright Knox exhibit, the in-arena history exhibit and more. What the year-long celebration told me was there is a wonderful opportunity for a permanent Sabres Hall of Fame. 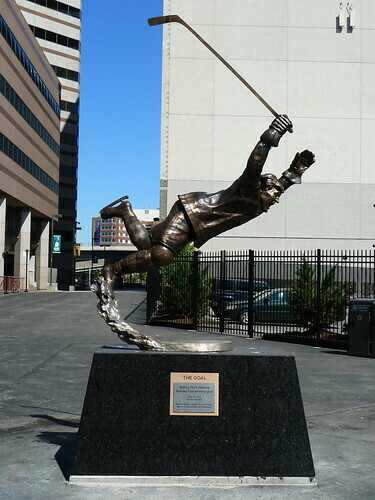 The Bobby Orr statue outside of TD Garden offers a nice template for the Sabres to potentially draw from. I’ve shown interest in the Sabres involvement with the space which formerly housed the Ira G. Ross Aerospace Museum and the Backstage Club prior to that. Previous posts have been dedicated to my pipe dreams and I even used the Blog Summit forum to offer a suggestion regarding the space. For those who haven’t read up on the subject; I envision the Sabres taking advantage of the empty space as a team-oriented Hall of Fame. Better yet, the 12,000 square feet (thanks Mr. Black) could be devoted to Buffalo hockey history. Regardless, I see that space as a perfect spot to celebrate the team’s history. In addition to putting together a Hall of Fame, I have come upon another idea regarding honoring the team’s history around the arena. My most recent light bulb moment comes thanks to the Pittsburgh Penguins. The Pens will be unveiling a Mario Lemieux statue outside of CONSOL Energy Center. Much like Chicago, Detroit and Boston (to name a few), the Penguins will immortalize their greatest player with a statue outside of the arena. Why don’t the Sabres do the same? Gilbert Perreault is the most obvious choice for a statue near the arena. The history of the French Connection makes the inclusion of Rick Martin and Rene Robert a no brainer. Including the other three retired numbers would be a tough call. While Tim Horton was properly honored by having his number two retired, some debate the reasons for hanging Pat LaFontaine and Danny Gare alongside the other four. Considering the misgivings some have about the two most recent retired numbers, there is good reason not to include them. However, a statue(s) honoring the French Connection should be an easy choice. The plaza between the parking garage and First Niagara Center is probably the best place to put these. There is plenty of space and it is a location where a majority of fans enter the arena for each game. While it offers plenty of space for the French Connection, there isn’t much additional room for additional statues to be added. That brings me to the true pipedream. Even though the Sabres don’t have nearly enough history for a true monument park, there possibility to form something similar within the Canalside district. The French Connection would again be the center piece for this idea. But including Horton, Gare and LaFontaine would be necessary. I include the latter three because of necessity, not strictly based on merit. This is mostly because of the eventual inclusion of Dominik Hasek among those with a retired number. Taking advantage of the numerous small lawns the currently infest comprise a majority of Canalside, would allow for the team to create a collection of the team’s greats just a few steps from FNC. If a HOF was developed, the two attractions could work hand-in-hand to bring fans to the arena and larger waterfront district. Perhaps the most shocking fact is that this idea would fall in the “lighter, quicker, cheaper” banner that many have adopted as their manifesto. Obviously this is a pretty ambitious idea that would take some leg work on the part of the Sabres. However, it is also a unique opportunity to celebrate the history of a team so many love while engaging the community with free artwork for them to admire during the season or even the summer while they’re exploring downtown. How about a statue of Lorentz killing the bat?